Lots of riders are getting into dual sporting, as public roads get busier and less enjoyable. Most of the world is unpaved, and there are miles and miles of interesting "all weather" roads and trails begging to be explored. What "dual sport" means is a dirt-ready motorcycle that is also street legal. That is, you don't have to transport some dirt machine to a trailhead; you just get on your bike at home and head out, knowing you can follow whatever roads or trails strike your fancy. Yes, some riders take their fully loaded touring bikes out on smooth gravel roads, but wrestling a heavyweight around on loose surfaces can be extremely tiring and even dangerous. So if you really want to go exploring those remote forest service roads up in the hills, how should you go about it? What sort of machine would be ideal for your purposes? What kind of riding gear would you want? How would you set up the suspension? And what other concerns should you be aware of? Carl Adams is a seasoned dual sport rider from Nevada who, after many years of riding, developed a training program for club members. This book grew out of that training, laying it all out for you in easy-to-read text and illustrated by full-color photos. 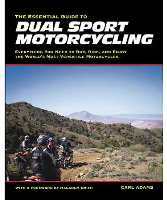 The book is organized into four sections that include bike selection, bike setup and riding gear, Riding techniques and trailside repair, and navigation. Some of the chapters include riding exercises to help you improve your off-pavement skills. With more than 45 years of motorcycling under his helmet, Adams clearly has a practical approach to dual sporting, and he wants to share his knowledge. If you're a street rider interested in dual sport riding, this is an ideal primer to give you a head start. If you already have some dual sport experience, you'll find information on more advanced subjects such as using GPS to navigate and participating in organized events. Dual sport veterans probably know all this stuff, and might even get a chuckle out of Adams' advice about using skateboard pads to protect your knees, or wearing double-front Carhartt pants for summer riding. But if you're trying to get into dual sporting on a budget, his suggestions might be useful. What this book doesn't cover is the paved half of dual sporting. Adams excuses himself from saying much about riding paved roads, because he feels there are already "�many good books on street riding and touring�", although he doesn't suggest any of them by name. Nor does Adams deal with multi-track motorcycles such as enduro sidecar rigs or quads. Clearly, this book focuses on the dirt side of (two-wheeled) dual sporting. To Adams' credit, the royalties from this book will all go to the Pediatric Brain Tumor Foundation, so you can feel good that buying the book contributes to a charity best known for the "Ride For Kids" motorcycle events. Reviewed by David L. Hough. This title is available by clicking here . Ken Condon is a professional illustrator and photographer who also happens to be a motorcyclist, moto-journalist and riding instructor. He currently contributes the monthly Proficient Motorcycling and Street Strategies columns to Motorcycle Consumer News. Condon is an enthusiastic amateur road racer and track school instructor, and also a RiderCoach for the Massachusetts motorcycle safety program. Ken wrote the book, and worked with Dan Kennedy of Whitehorse Press to develop a companion DVD that demonstrates the riding techniques. This isn't a simple collection of Condon's MCN columns, but rather a whole new look at motorcycling skills and riding strategies. Riding in the Zone contains a lot of street-riding wisdom similar to Ken's MCN columns, but it's written in an entirely different manner that I suspect you'll find new and informative. About half the book deals with mental concepts such as risk awareness. The other half is about physical skill development�mastering motorcycle control. Ken has a lot of experience explaining difficult concepts such as countersteering. And the companion DVD is a great tool for seeing the techniques in action. Frankly, I'm impressed. OK, the book is a bit on the small size�only 144 pages. But as I began to study Ken's advice, and view the companion DVD, I realized that it's good, solid information at the right level for an experienced rider. There are lots of color photos and diagrams in the book. The DVD is done simply but with lots of live action to demonstrate what Ken is saying. The quality is excellent, so you can easily understand the techniques. And with so much information on the DVD, that means the book can be as compact as it is. It's small enough to fit in a tank bag, so you can take it out to the practice range. And the semi-hard, coated cover and high quality binding mean it's likely to survive the trip. Why are riding skills so important these days? Well, back in the 1970s and 1980s, motorcyclists were often victims of collisions with errant automobile drivers. Today, more and more riders are crashing their bikes in non-collision situations. It's clear that we need more emphasis on controlling our bikes. You might wonder how I can praise a "competing" book, considering that I also have skills books on the market, including the recent second edition of Proficient Motorcycling. I don't see Ken as competition, but rather an associate. We're both attempting to help riders improve knowledge and skill in our own ways. In my opinion, Riding In The Zone is one of the best motorcycle skills books on the market today for the street rider. You really ought to get a copy. The safety nannies among us may notice that the motorcyclists in many of the photos are not wearing ideal riding gear. That's partly because Ken photographed riders on the east half of the USA�many of whom ride with little or no protection. Ken believes in high quality riding gear, but also understands that the best protective "gear" is having the knowledge and skills to avoid a crash.